With much excitement and anticipation, we moved on to Lesson 2 in Drawing With Children! Since our first lesson, Big Sister has been very interested in drawing. She worked her way through Ed’ Emberley’s Drawing Book of Animals while waiting for her next lesson. It’s so much fun to watch children learn as their interest is piqued! We began our drawing lesson with some of the recommended warm-ups with Little Sister joining in. She really liked finding the elements of shape in our surroundings, as well as the Random Warm-up (p. 65) where we practiced making all of the elements in various colours. Then Big Sister repeated the Level 2 exercise for determining starting level, and she improved a bit so I gave her the Level 3 exercises as well. She did fairly well, so I think we will end up trying out all three levels for each lesson. Lesson 2 is Drawing from Graphics, and it begins with some drawing tips. The author discusses following your feelings, overlapping, making adjustments and changes, where to start, making preliminary sketches, texture, and shading. I went over the basics as suggested, and showed Big Sister the examples in the book of drawing with objects overlapping each other and how to make adjustments when you aren’t satisfied with your work (transforming, adding on, covering up, and tracing). Big Sister’s Leo! I love the little birds she added flying overhead. Then we got to the fun part: Leo the Lion! Leo the Lion is the Level 1 project for this lesson and a photo of an embroidery graphic is given, along with a simplified drawing. We made some preliminary sketches to determine how big to make our lions, leaving room for whatever else we wanted in the picture (trees etc) and then jumped right into the step by step instructions. Little Sister came back to join us for this part, and it only took a few minutes before I wished she hadn’t. All that wonderful information offered by Mona Brookes in the introductory chapters regarding attitudes, environment and quietness while drawing? Our drawing lesson soon became an example of what not to do! What developed in my dinning room was what one could only describe as a toxic art environment: Baby Sister screaming in the high chair as I doled out pieces of grapes and Cheerios. The Frances Audio Collection playing in the background (Little Sister popped it into the player when she became bored of all the talk about overlapping and adjustments). 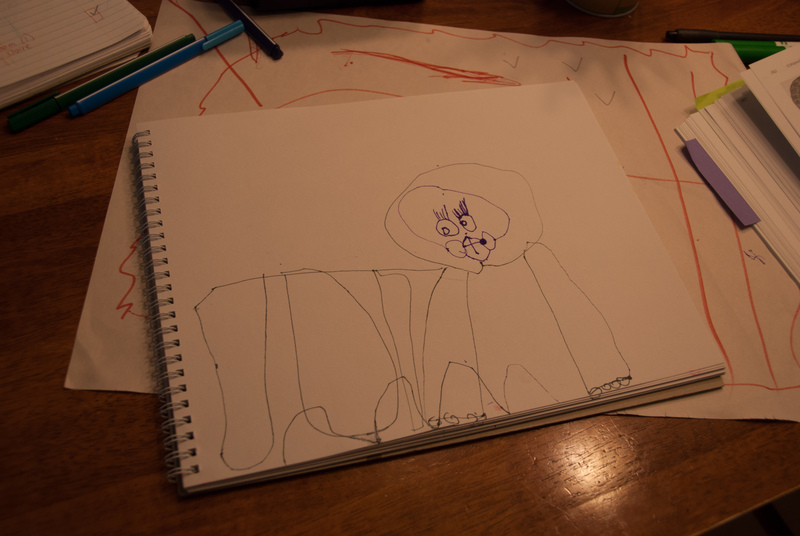 And the piece de resistance was Little Sister crying, and then having a full on tantrum while trying to draw the lion and imploring me to draw it for her. She was just so unhappy about her ability, it was heart breaking really. 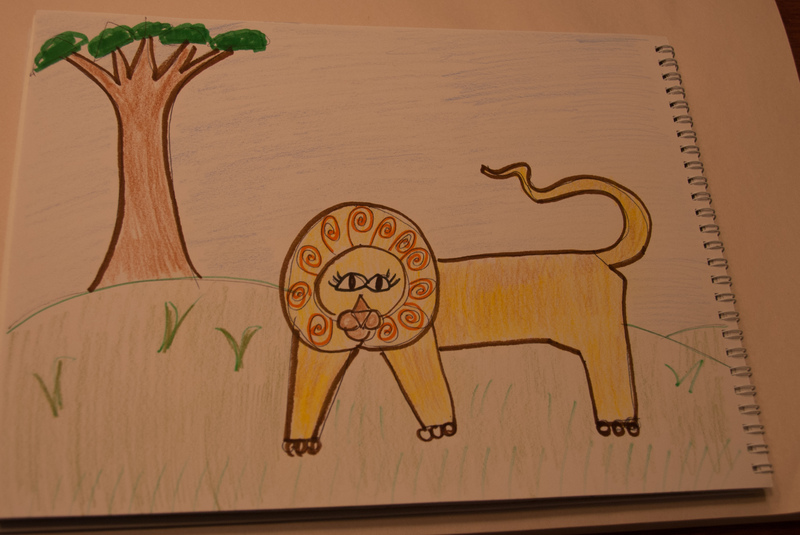 Little Sister eventually settled down and finished her lion with us but was greatly displeased throughout. I think it turned out pretty cute though! Big Sister had a lot of fun, and despite Little Sister begging her to come play, she decided to keep at her work and add a tree and birds to her landscape. I think I’ll break out the Eric Carle books this week so we can practice copying some simple, animal graphic shapes. Animals are so much fun to draw! 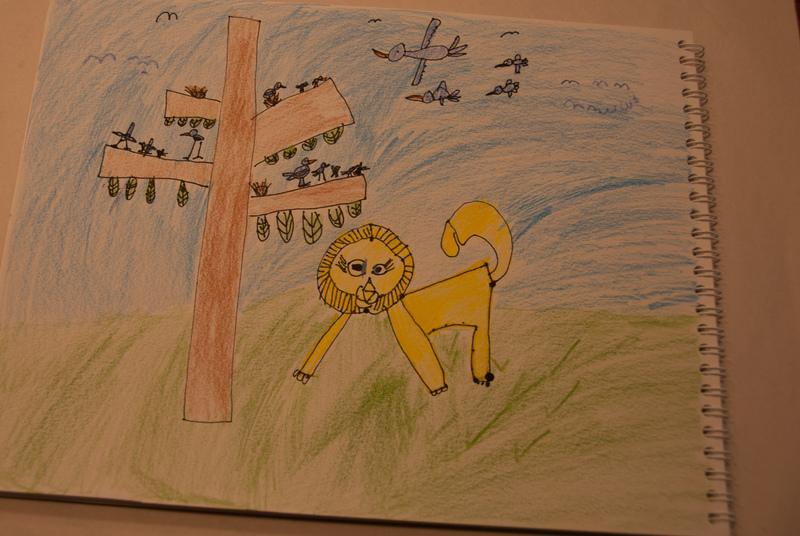 What have your children been enjoying drawing lately? 1. Drawing With (My) Children: Our Homeschool Experience Using the Monart Method.